Home » Latest News » A big ‘Credit Union Awareness Week’ thank you! 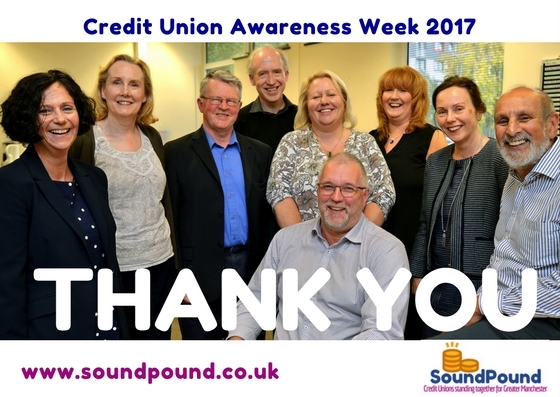 2017 marked the first ever Greater Manchester Credit Union Awareness Week and the launch of our one stop shop of credit unions in the region- SoundPound. The campaign had a Halloween theme, but a year-long message: urging people looking to borrow to not get spooked by national rip-off lenders – and instead, get local. Kick-starting with ‘Thriller’ flashmobs across the region, the campaign picked up support from political leaders including Andy Burnham and press sites such as I Love Manchester. We are incredibly grateful to our partners, colleagues and customers who backed the campaign. We reached thousands of people and received hundreds of competition entries- congratulations, Jennifer Thorpe, for winning a £100 voucher for a restaurant of your choice! But our mission continues. While we may not be able to complete with big advertising budgets and dedicated marketing departments, we have an army of supporters who believe in the credit union mission to help people take control of their finances- and keep money in the local area.